Still waiting on 2nd place winner! Still waiting on 1st place winner! See what we've been up to lately! Congrats to our 2018 TUFF Fishing Derby Winners! The brief 2018 TUFF Derby Awards Ceremony took place November 24th at the Carolina Trace Gatehouse. Last year the weather outside was sleeting for our annual December awards event and group photo op. So this year yours truly decided to have it during the Thanksgiving holiday when the weather would be warmer and nicer. Right?? Park at the turn around, take a picture of the group with our beautiful Lake Trace in the background? 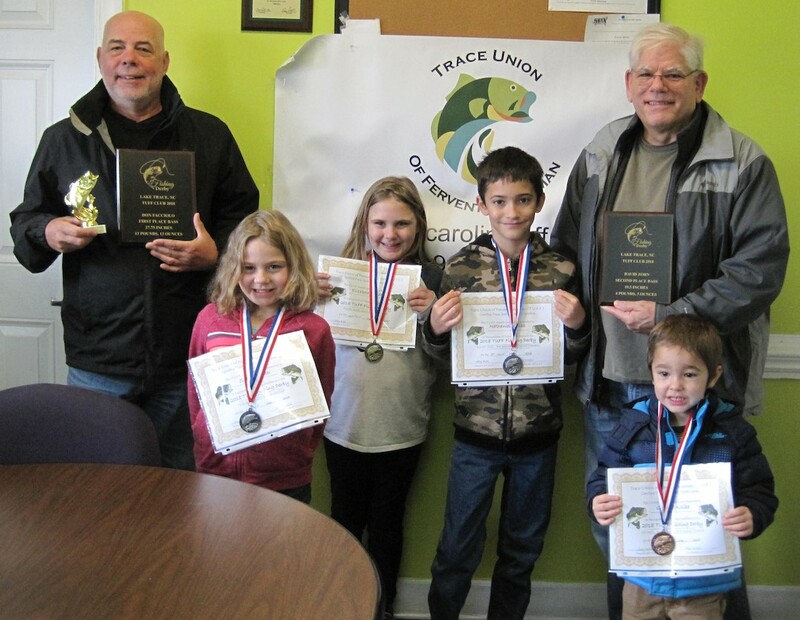 We had six youngsters who registered their catches and won a prize during our 2018 TUFF Derby which runs every year from March 1st to November 15th. Pictured above is Elizabeth Bender (LT) who reeled in this eleven inch catfish during our March 31st Spring Break "Fish for Fun" lesson at the CTCC dock. Last year Elizabeth was a 3rd place winner with a 10.5 inch catfish. Now she adds a 1st Place Catfish gold fish medallion to her bronze one from last year. Way to go Elizabeth! More Great Fishing Adventures at Perkins Pond with FBC Children! Fri Jun 22 2018 - Don Facciolo caught a Bream! A Bream was caught by Don Facciolo of Mallard Cove on Fri Jun 22 2018. The fish measured 12.5 inches long with a girth of ? inches and weighed 1 lbs 14 ozs. Sun Jun 17 2018 - Dave Zorn caught a Largemouth Bass! A Largemouth Bass was caught by Dave Zorn of Sedgemoor on Sun Jun 17 2018. The fish measured 19.5 inches long with a girth of 13.25 inches and weighed 4 lbs 3 ozs. Morning fishing (8:40 a.m.) worked out well! This size fish in Lake Trace is a terrific fighter. Sun Jun 10 2018 - Don Facciolo caught a Catfish! A Catfish was caught by Don Facciolo of Mallard Cove on Sun Jun 10 2018. The fish measured 24.5 inches long with a girth of 16 inches and weighed 8 lbs ozs. Caught in about 12 feet of water using very slow retrieve. Sun May 27 2018 - Don Facciolo caught a Largemouth Bass! A Largemouth Bass was caught by Don Facciolo of Mallard Cove on Sun May 27 2018. The fish measured 27.75 inches long with a girth of 21.5 inches and weighed 13 lbs 13 ozs. Sat May 26 2018 - Don Facciolo caught a Largemouth Bass! A Largemouth Bass was caught by Don Facciolo of Mallard Cove on Sat May 26 2018. The fish measured 25.75 inches long with a girth of 20.25 inches and weighed 11 lbs 3 ozs. Sun Apr 30 2017 - Andrea Thompson caught a Catfish! A Catfish was caught by Andrea Thompson of Wisconsin on Sun Apr 30 2017. The fish measured 22 inches long with a girth of 20 inches and weighed 11 lbs 0 ozs. Tue Mar 28 2017 - Chuck Byrd caught a Largemouth Bass! A Largemouth Bass was caught by Chuck Byrd of North Shore on Tue Mar 28 2017. The fish measured 27 inches long with a girth of 21.5 inches and weighed 13 lbs 0 ozs. Digital scale used and witnessed by a person at CTCC dock. Thu Mar 02 2017 - Buster Harrill caught a Largemouth Bass! A Largemouth Bass was caught by Buster Harrill of North Shore on Thu Mar 02 2017. The fish measured 24 inches long with a girth of 17 inches and weighed 8 lbs 10 ozs.